Now, I may be a modern man (you know, the sensitive kind, in touch with his feminine side and all that) but I still cannot bring myself to carry a “man bag.” I’m sorry, I know it makes perfect sense, but if I did that, I’d have to grow breasts and change my name to Natalie. 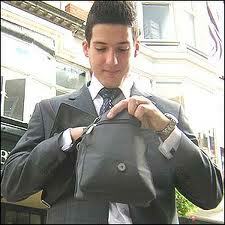 you think you are, if you carry a purse, you look gay. And don’t try telling me my briefcase is just a man’s handbag in disguise: a briefcase is a briefcase, it contains stuff I need for work. Besides, I don’t carry it all the time, so if I did put anything handbaggish in there—like wadded up tissues, half a roll of Life Savers, eight ball point pens that don’t work and £4.87 in loose change jangling about in the bottom—I would not always have ready access to it. So that’s why I sort of like the cold weather (“sort of” being the operative phrase; but at least give me credit for trying to tease a silver-lining out of this miserable weather). When it’s cold, I wear a jacket. That jacket has pockets—lots of them—and I can carry around all of life’s essentials which, during the warmer months I have to go without. All of these items are, for this time of year, indispensable. In other months I might trade the Santa hats for my cigar holder, lighter and cutter, or the scarf/hat/glove combo for an ordinance survey map of the Ashdown forest and a micro-bralla. But the upshot is, as long as it is cool enough for a coat, I have a place for all my stuff. During warmer weather, I am forced to rely on my wife. Though this isn’t a tremendous hardship, it is 1) inconvenient, because, like my briefcase, I don’t always have my wife with me (but unlike my briefcase, she makes for better company on long bus rides), and 2) I fear the items I consign to my wife’s handbag may become lost among the seemingly endless items she keeps in there. Somehow, my wife has acquired the handbag Hermione Granger used in Harry Potter and the Deathly Hallows, the one she kept a tent, camping furniture and a portable shower in. I’m serious: one time, while we were out to dinner, a need arose for her (we’re talking about my wife now, not Hermione Granger) to record a date in her diary. She plopped the bag on the table, dug through it and extracted an appointment diary thick as a Michener novel, bulging with receipts, sticky-notes and several wadded up tissues. She declared it was her work diary, not her personal diary, so she laid it down, rummaged again and pulled out another novel-sized book. This time, it was just a plain note book, so she laid that aside and dug in again. On the third dip, she came up with the correct, and equally bulging, diary. She then pulled out half a dozen ball point pens, none of which worked, so I loaned her the pen I carry in my coat pocket. In short, copious as my coat capacity is, her handbag puts it to shame, which makes me miss, even more, all the pockets, folds and secret compartments I have to go without during the warmer weeks. Sadly, I won’t have to worry about that for the foreseeable future. And don’t entertain any ideas about getting me a “man bag” as a belated Christmas (or early birthday) present. I wouldn’t use it—I’d never be able to fit all my stuff in it.